An easy mountain bike ride from Bendigo to Heathcote on the O’Keefe Rail Trail. Just under 52KM one way, the rail trail is ideal for families and small groups to tackle the distance and head out to Heathcote. The trail is mainly flat and well maintained. 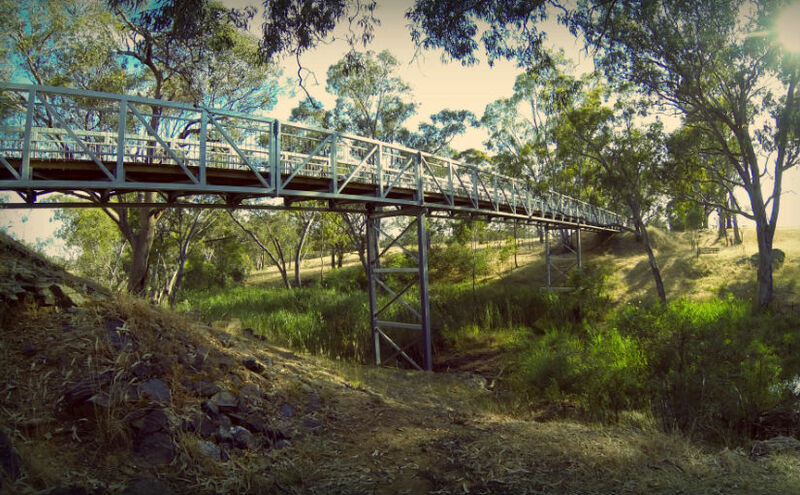 This rail trail is supported by the Friends of the Bendigo Kilmore Rail Trail. Please consider supporting or donating to this group. From Bendigo to Axedale it’s mainly downhill, and from Axedale it’s a steady climb all the way through to Heathcote. See GPS data below for altitude and climb information. Along the O’Keefe Rail Trail there are plenty of areas to stop and take a break. From purpose build benches, Axedale Pub, reserves, Lake Eppalock and various picnic areas. There are ample opportunities to take photos and checkout the scenery. The picture displayed on this post, is the bridge over Axe creek and has been viewed over 20,000 times on Google and is one of my first images I took of the O’Keefe Rail trail almost 3 years ago. I’m been fortunate to ride both ways of the O’Keefe Rail Trail as well as walk the trail from Bendigo to Axedale. The O’Keefe Rail Trail passes Lake Eppalock and this is a great area to stop and have a break. Pity the lack of water in this area; however the trail passes over several bridges and embankments while heading towards Heathcote. The ride will take anywhere from 3 to 4 hours with regular rest stops. You can download and view GPS data from the mountain bike for the entire O’Keefe rail trail. I’ve ridden both ways (Bendigo to Heathcote and Heathcote to Bendigo) and the information is available free if needed. Note: The trail starts at Lake Weeroona, however the GPS data is missing this information. I also stopped a little early on the Heathcote bound trail to get off at the Heathcote Information Centre. Take plenty of water. There is no water on the trail. If stopping at Axedale, fill up water for the ride to Heathcote. Best time to leave on this trail is early morning or late evening. You will see plenty of wildlife on the trail if leaving around 5.30am or 4.00pm onwards. Check your bike riding gear, make sure everything works. Take a spare tube, patches and a small toolkit for repairs. In certain areas closer to Heathcote, the trail leads through private property. Respect this area by staying on the trail and not leaving any rubbish. Keep animal gates open/closed as they were found. The property owners have given permission for O’Keefe Rail Trail to go through their property.